Californian scientists think they may have discovered the part of the brain which makes people fear losing money. The study, reported in Proceedings of the National Academy of Sciences, looked at two patients who had damaged their amygdala, deep within the brain. These patients were less worried about financial losses than the normal volunteers they were compared with. The scientists say this could translate to how people make decisions in fields ranging from politics to game shows. 'Loss aversion' describes the avoidance of choices which can lead to losses, even when accompanied by equal or much larger gains. Lead author, Dr Benedetto De Martino, explains: "Imagine you're on Who Wants to Be a Millionaire. This is a novel and exciting study. "You've just answered the £500,000 question correctly and have moved on to the final question. "You're down to your 50:50 lifeline but don't know the answer. "If you get it right, you'll win £1 million; if you get it wrong, you'll drop back to £32,000. "The vast majority of people would take the 'loss averse option' and walk away with £500,000." This study, carried out by scientists from the California Institute of Technology (Caltech), set out to find out if the amygdala plays a role in causing loss aversion. It looked at two women who had a rare condition which produced lesions on their amygdalae but no other brain damage. The lesions prevented them from perceiving, recognising or feeling fear. The two women were each matched with six control volunteers who had similar age, income and education. The participants were offered a series of gambles to test whether the chance of losing money affected their willingness to gamble. The study found that healthy volunteers would only opt to gamble if the potential gains were one and a half to two times the size of the potential losses. But the patients whose amygdalae were damaged would play even if there was a much poorer ratio between gains and losses, and one sometimes played even if the potential loss was greater than the potential gain. 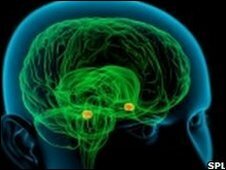 The authors say that a fully functioning amygdala appears to make people more cautious, and afraid of losing money. "It may be that the amygdala controls a very general biological mechanism for inhibiting risky behaviour when outcomes are potentially negative, such as the monetary loss aversion which shapes our everyday financial decisions," said Dr Benedetto De Martino, who is currently a visiting researcher at University College, London. He pointed out that loss aversion has been shown in many settings including high stakes game show decisions, financial markets, politics, and also in monkey behaviour. It probably derives from "a basic evolutionary defence mechanism", he said. He added that it was helpful to understand its basic biological mechanisms so that policymakers could design policies to address it. "This is a novel and exciting study. The authors conducted a very elegant and neat experiment. "The amygdala is an area of the brain that is important for normal emotional responses and for how we perceive our environment. "It plays a subtle role in helping people to learn the attributes of good things and bad things. "Most people have been found to have a bias against losses, but this study shows very clearly that when the amygdala is damaged, this "loss aversion" disappears."